Soak the cornhusks until soft (about an hour). To make the rajas: Choose your preferred chiles and, using your hand, coat them with vegetable oil. Place the chiles over an open flame and allow them to char on both sides. Once completely charred, place them in a zip-lock bag and seal, allowing them to steam for 45 minutes. Remove them from the bag and peel away the burned skin and rinse them under running water. Cut off the stems and remove the veins and seeds, and cut into long strips, count them, and divide them equally. Place the strips in a bowl. To make the tamales: Remove the cornhusks from water and drain. Take two tablespoons of masa dough and spread onto the inside of the cornhusk, leaving a 2-inch space from the bottom of the leaf. Add strips of rajas in the center with a slice of cheese. Fold one side inward enough to cover the filling. Then roll until both edges meet and form a compact tube. Take the bottom half (where there is no masa) and fold up. Place the tamales (face-up) in a steamer with water at the bottom, and steam for 1 1/2 hour. At half cooking time, add more water, if needed. When your tamales are ready, let cool for twenty minutes. The masa should pull away from the husk with no resistance. Masa can be bought ready-made at Mexican markets or you can make your own by following the directions on a packet of corn flour. Two words: Cheese and Chile. PERIOD. Two of my favorite flavor combinations ever! They really do go hand in hand. If they were people, I imagine they'd be lovers. Ok, seriously speaking, I'm not lying when I say this flavor combo is yummy. These two also happen to be the main ingredients to the tamales I've made every year for the last 10 years: my homemade tamales with rajas (chile strips) and cheese. 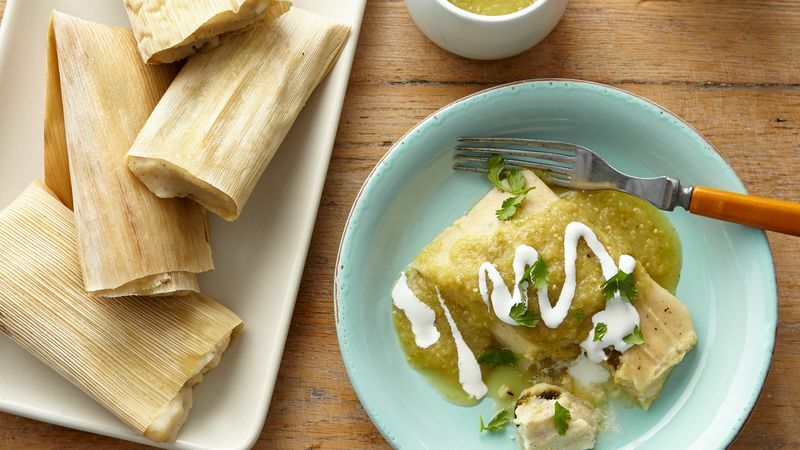 A lot of people think tamales are a long and laborious dish to make. And maybe they are… but oh are they worth it! When I make them with my aunts and friends, we get a production line going with everyone doing a certain task. My mom and my two aunts are spreaders; my best friends are fillers, and the rest of us are folders. It's works really well! We chat away as we make our tamales. It's a wonderful tradition that makes me feel extremely close to the gals in my life. I recommend you give it a try and get a little girl bonding time over tamales.